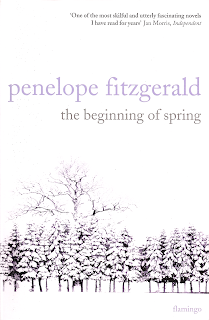 On Judith’s Christmas list were some novels by Penelope Fitzgerald, which Flamingo have issued in a uniform paperback series. The cover designs are nicely restrained, and set in Adobe Caslon. The one note that jarred for me in the otherwise careful composition was the bad fitting of the f and the i in the author’s name. I can see that a ligature, while normal in running text, might have called attention to itself in display, but the alternative of combining the kerning f with a dotless ı could have resolved the issue. The ı and t would have needed some adjustment to their spacing (I don’t know if dotless-ı combinations are in most kerning tables). The text of the books is in Monotype Spectrum, which has nice roman lower-case, capitals, and small caps, but rather awkward figures – neither the ranging (too big) nor the non-ranging (too small) are quite right. As if to acknowledge this, the volume that has a contents list sets this in Janson, where the figures are more normal. Spectrum italic is rather tight, but in a novel, where italics are only used occasionally for emphasis, this isn’t too obtrusive. But the word spacing in both the volumes I’ve seen is much looser than I would expect when using such a relatively condensed typeface. Perhaps the desire was to reduce the amount of word division, or to bump the text out to a particular extent.